The Dhaka International Trade Fair (DITF) drew a huge number of visitors on Friday, as it was a weekly holiday. 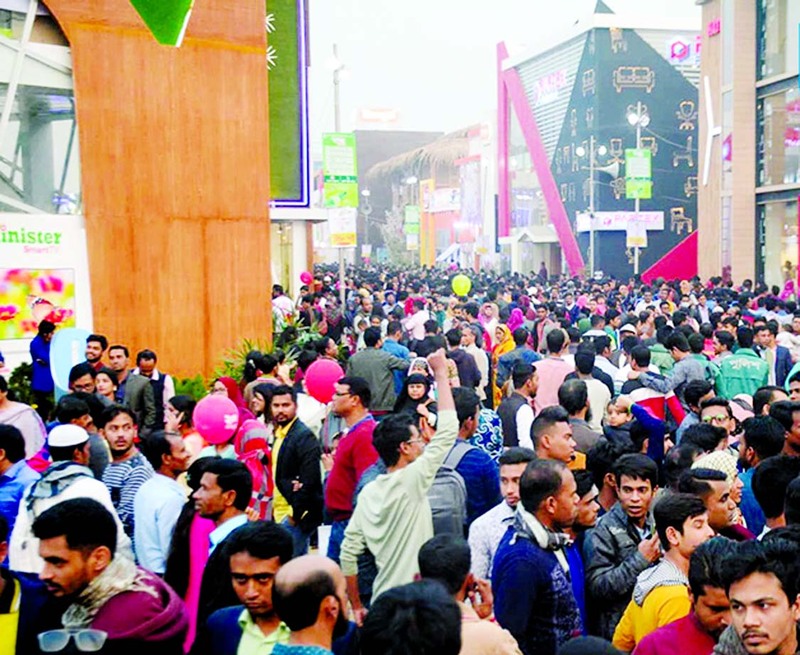 The overwhelming participation of visitors apparently turned the fair ground at Sher-e-Bangla Nagar into a human sea leading to a nightmarish traffic jam in the nearby areas. By the afternoon, there was a heavy rush inside and outside the fair ground. Heavy presence of traffic police and security personnel were not able to control the traffic causing huge suffering to the commuters. Even the organisers had to restricted smooth entry of visitors to fair ground due to heavy rush. Majority of visitors thronged the stalls displaying home appliances, kitchenware, plastics and textiles or clothing items while traders were seen happy over rising trend of crowds. They, however, expressed dissatisfaction over limited sale of their products and goods. problem as people parked vehicles wherever they found a place obstructing the movement of traffic," said a traffic policeman. Traffic snarls were reported even at 10 pm as all the connecting roads were packed with huge crowd and cars. Mehdi Hasan, a resident of Mirpur-10, said, "As it was a holiday, I took my parents and kids along, but it was a nightmare reaching back to my car as I parked it about a kilometre away." He said parking of vehicles was not properly controlled resulting a chaotic traffic situation around the area. "It took two hours to reach my Motijheel media office yesterday as traffic has become a total mess in Rokeya Sarani," Rafi Ahmed told The New Nation.